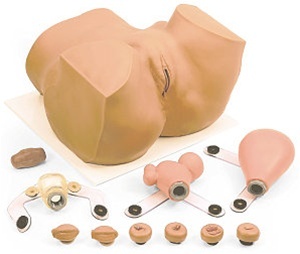 Eva is a lifelike female pelvis for developing diagnostic skills in gynecologic procedures through anatomical instruction, abdominal palpation and speculum instruction. Our manikin eases the way into clinical experience by allowing both the comprehensive, stress free introduction of gynecological examinations, and the more advanced tactile comparisons of pelvic pathologic conditions in the classroom setting. Constructed of soft, easily cleaned vinyl materials that approximate skin texture, Eva provides detailed life-like anatomical features and references. Included are the following interchangeable inserts: normal cervix and uterus for IUD insertion and removal, normal parous cervix, cervix with endocervical polyp, cervix with ectropion characteristics, cervix with neoplasia (carcinoma), pregnant 10 week uterus, and 2 adnexal masses.